So, a bit of an a round-about way of getting to a review of Shadow of the Hegemon . . .
Ender's Game and Enders Shawdow--two exciting books about the same exact same thing, but told from the perspectives of two different characters in the story. Ender's Game has 3 sequals, and when I had finished Ender's Game I immediatly jumped into Speaker for the Dead, the second book in the Ender story. Oh, how I hated it! It was nothing like Ender's Game, and I couldn't even get through a few pages. It was so bad I actually returned the ebook to Amazon, along with the other two books that make up the four Ender Stories. So instead I turned to Ender's Shadow--Bean's story--and loved it more that I did Ender's Game. 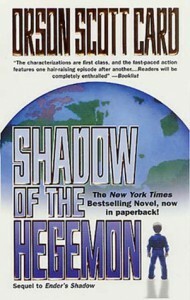 Naturally, I wanted to find out what happens next in the story, so I opened Shadow of the Hegemon. To my (initial) disapointment, this book was nothing like Ender's Shadow! It was a repeat of Ender's Game all over again! But unlike Speaker for the Dead, this book held my attention and finally, I got it . . . The "Ender Universe" isn't about battle school, it's about the children that were forced into battle school! What happens to them after? I picked up the sequals to read more about more space battles. Instead, was treated to a much deeper and more meaningful reading experience as I got to know more of the depth of the characters from Enders Game and Enders Shadow. I get to see my favorite characters experience family love, romantic love, true love, political drama, arch enemies, true friendships, military strategy, loyalty, traitors, coming of age, parents who are more than they seemed, and on and on. The sequals to Ender's Game follow Ender and Valentin into space, and the Ender's Shadow sequals follow Bean, Petra, Peter, and everyone else back to Earth. Now that I understand, I'm leaning pretty strongly towards giving Speaker for the Dead another chance--but not before I finish the Bean stories! Which brings me to what I thought of Shadow of the Hegemon. I loved it. I feel like it was a wonderful blend of intellect and suspense. I felt like I was smart for reading it and getting it, but also like a little kid reading a really exciting story. I gave it 4 stars, but I'd like to to be 4.5. It was a really fun read, but I have to not dilute my 5 star ratings too much or else 5 stars would lose significance. I enjoyed this story very much, but at the end I didn't want to stand up and cheer. I simply felt quite satisfied and curious to find out what happens next. Obviously, I give Shadow of the Hegemon my satisfied recommendation. BUT, do not even think of reading this book until you've read Ender's Game FIRST and Ender's Shadow SECOND. You will miss out on part of what make the story great if you don't read both those books first, and in the that specific order.